CEDAR's dialogue noise suppression (DNS) technology eliminates traffic noise, air conditioning, wind, rain, babble and general background noise from audio signals. It will also help to compensate for unfavourable acoustic conditions and poor microphone placement, and will even suppress excessive reverberation. 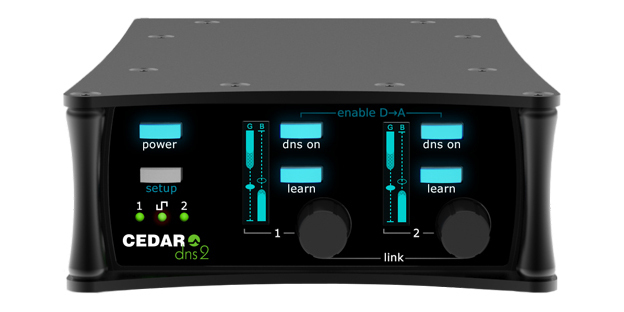 The 2-channel DNS 2 is the first DNS designed specifically for portability and extreme simplicity of use. It hosts a new DNS algorithm that requires nothing more than switching on the Learn function that identifies and adapts to the background noise, and dialing in the amount of noise attenuation required. Retaining the near-zero latency of all its predecessors, it's suitable for use in all situations - location recording, live-to-air broadcasting, live sound in venues such as theatres, concert halls, conferences venues, and places of worship, as well as studio work and post. What's more, despite being so small and light that you can slip it inside your pocket or equipment bag, the DNS 2 offers analogue line and microphone inputs (the latter with optional 48V phantom powering), an AES3/AES11 digital input, and both analogue and digital outputs. This increases its flexibility even further, and its 12V power input means that you can use it in the middle of a field as easily as in the studio or the edit suite.